Starting in the 1930s, when Raymond Chandler changed the scope of the detective novel genre that had, before him, traced its roots back to Edgar Allan Poe’s “The Murders in the Rue Morgue” and Arthur Conan Doyle’s Sherlock Holmes (the most famous of all fictional detectives), America has laid claim to the detective novel as a home-grown reflection of its urban culture. With the advent of film, and its natural evolution into television, the detective novel developed into a far more complex landscape of police, criminals, the judiciary and the growing use, and importance, of modern scientific investigative methods. The tough, street-smart private eye gave way to an orchestral arrangement of cynical police detectives, scientific nerds trained in physiology and genetics, and public prosecutors trying to do their jobs in an overburdened and understaffed system. In 1951, television was still in its infancy and experimenting with wildly different formats. The ever-growing audience wanted more than the traditional fare of variety shows and comedies. The result was a whole slew of shows that, given the times, were far more realistic. The critically acclaimed Dragnet, produced by Jack Webb, was the first cop show to win an Emmy. Webb took the tough-talking detective from the pages of the hardboiled novel to the television screen. The show started each episode with the statement, “What you are about to see is true,” a reminder that many of the story lines were taken from real-life cases. The protagonist, Sergeant Joe Friday, expressed what David Marc called a “relentless crime fighting consciousness” that “left little room for sympathy for the twisted vermin who opposed the public order.”2 Dragnet’s view of the world was a paranoid one in which the forces of evil were constantly held at bay only by the relentless efforts of men like Joe Friday. On the basis of Dragnet’s success and America’s growing appetite by for police shows, Webb also produced Adam-12, which premiered in 1978, providing a “day on the job” look at police work by two clean-cut officers, and Hawaii Five-0, which ran from 1968 to 1980, the longest running crime show until Law & Order (1990–2010) came along. As the years went by, the police crime drama became a staple of American television. Although virtually every country in the world adopted this format and produced excellent television and film versions, the American crime drama was accepted as the “standard,” and most of the more popular U.S. productions were translated and shown around the world. In 2015, Eurodata TV Worldwide named the American police drama NCIS “The Most Watched Drama in the World” for the second year in a row. 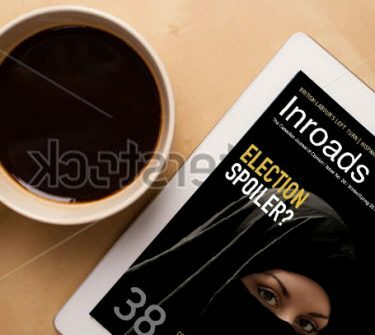 The show garnered 55 million viewers across the globe in 2014, according to the network, and is licensed in over 200 markets worldwide and in over 60 languages – from Arabic to Vietnamese. Other American crime drama shows that have earned that distinction include CSI and The Mentalist. There is something inherently American about the crime drama genre, and most of the world has, in the past, chosen to watch shows about detectives and crime that have been produced in the United States. The most popular shows were not necessarily the best, by any means. Yet even when it came to quality, U.S. shows stood out. 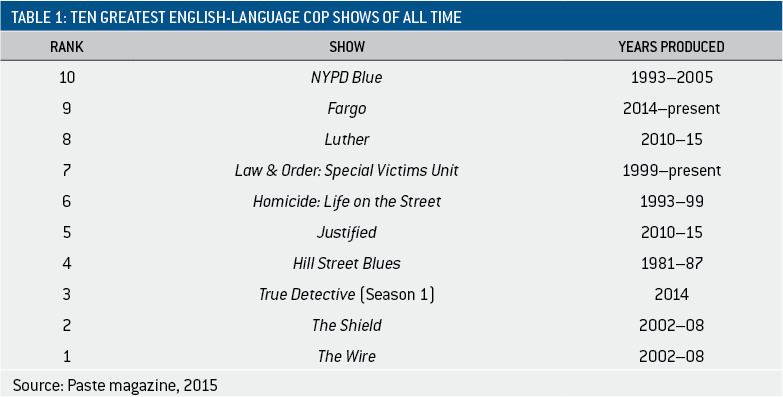 Of course, any attempt to rank television shows is subjective. The best such source, when it comes to popular culture, is probably Paste magazine, which for two years in the mid-2000s had a weekly segment on CNN Headline News called “Paste Picks,” in which editors would recommend new albums and films.3 In 2015, Paste published a comprehensive list of the “40 Greatest Cop Shows of All Time.” The top ten, listed in table 1, are still considered to rank among the best produced, regardless of genre. Of all of these shows, only one, the British drama Luther, was not produced in the United States. As the list is based on television shows in which the spoken language is English, there is a built-in bias to this ranking – but not as much as one might think, since English has been the language of a large proportion of such shows. That apparently is now changing. In the last few years, there has been an explosion of superb crime dramas produced throughout the world. In our globalized world with its specialized streaming services that have a built-in audience for subtitled television productions of merit, these new shows are being seen by millions of people. Viewers are exposed to crime television series from countries other than the United States, presenting divergent pictures of social challenges and how they are tackled in different societies. When one views these shows, the language barrier quickly disappears. As a result of the subtle mix of easily absorbed subtitles and outstanding writing and production values, the viewer little notices that she is following the story by reading rather than listening. One salient feature is the important role of the female detective. 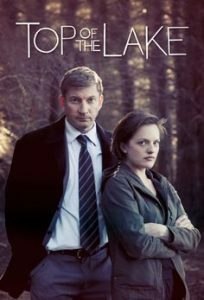 The New Zealand series Top of the Lake carries with it the pedigree and craft of Jane Campion, the Academy Award–winning director of the film The Piano. Initially about the investigation of a young pregnant girl by a female detective (played by Elisabeth Moss of Mad Men fame), it quickly evolves into a metaphorical battle between male and female psychologies. Campion’s landscapes, with their striking starkness, are as feminine in their imagery and concerns as The Wire’s are utterly and unapologetically masculine. The weaving subtext of the protagonist detective’s interactions with her all-male colleagues, who constantly strive to diminish her even though most of them never think of themselves as misogynists, will resonate powerfully with those accustomed to the testosterone-fuelled backdrop of American police shows. But the miniseries never directly takes up the issue of the role of the female cop. It’s about mindsets and prejudices, anger and fear, but mostly it’s about complicated people, male and female, coping with tremendous buried pain. Top of the Lake injects a huge dimension of social psychology and gender angst into a startling story about a terrible event and the detective who uncovers it. The fabric of this series takes the American crime drama to a level that has not yet been as eloquently attained by a U.S. production. 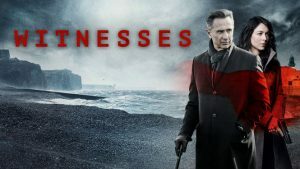 Witnesses, a French television police procedural drama noir series by Marc Herpoux and Hervé Hadmar, is another non-American show in which the lead detective is a woman and mother fighting for legitimacy in an all-male world. Set in a small coastal village in France, this is a quiet thriller of crime and dark secrets. Her investigation of an elaborately staged crime scene setting links the bizarre events to her former instructor, whose framed photograph is found at the scene. Her old mentor, who had retired after a car crash killed his wife, is forced to return to duty; but there is clearly more to him than the brilliantly written script lets on. But the Brits are catching up. River is a BBC-produced series by Abi Morgan about a genius whose unstable mind leaves him haunted by the ghosts of murder victims. 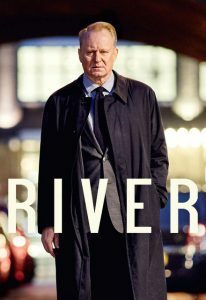 Unlike conventional crime dramas, River is an eclectic mix of the supernatural and a gripping story of the efforts of the metropolitan police to solve a teenage girl’s murder. Morgan’s story of a cop (Stellan Skarsgård’s John River) in the throes of a psychotic break that has him communicating with people who have died manages to get the viewer to suspend disbelief. The crisp writing and the authentic police dialogue transcend the clichés of the genre to present some of the real angst of mental illness. Although everything about the series is first-rate, including the performances of the other actors, this is really Skarsgård’s show to carry. He gives an unbelievably intense performance of a man living in the throes of a mental condition that he is acutely aware of, switching in seconds from distraction to fury, from twinkling joviality to sarcastic scorn, a detective unable to separate himself from the crimes that he investigates. There has never been a more credible, more original tortured TV detective than John River. 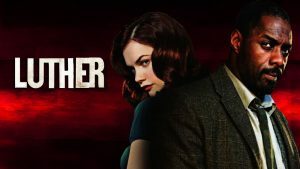 The novels of a number of British crime writers including Ian Rankin, Peter Robinson and Colin Dexter have found their way into generally solid but unremarkable television series. More notable was the 1991 six-part series Prime Suspect, written by Lynda La Plante and starring Helen Mirren. But the U.K.’s most recent important contribution was the BBC’s distribution of a remarkable 10-part series from Iceland. 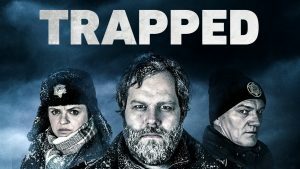 Trapped is a murder-mystery television series created by Baltasar Kormákur that had its debut at the Toronto International Film Festival in 2015. When a ferry arrives in a small Icelandic town just as severe weather closes all routes, a headless corpse is found floating nearby. Filled with diverse characters who all appear to have a past that will come back to haunt them, Trapped is not only gorgeous in every way, but a reminder that in police dramas, as in all dramas, a good story is always a good story. What Trapped illustrates so clearly is that what makes a TV series distinct is how the elements are shifted around and combined in distinct and memorable ways, then filtered through the voice of a creator and a home country. Iceland’s Scandinavian cousins have taken an important place in crime writing. Henning Mankell put Sweden on the map, and it became world-famous with Stieg Larsson’s Millennium trilogy. Many others, such as Norway’s Jo Nesbo, have joined the ranks. But the TV series based on them, such as the British-made series about Mankell’s detective, Kurt Wallander, are nowhere near the quality of Trapped. So, almost 50 years of unassailed American leadership seems to be ending. Of course the United States still produces stellar shows, most of them products of the premium networks and the new presence of the streaming giants, Netflix and Amazon. What has definitely raised the level of quality in the American productions has been the introduction of the longer story arc, a narrative played out over the course of a series of many episodes. The use of single-episode storylines, with the entire plot, from the crime to the police work to the dispensing of justice, all told in the space of less than an hour, appears to be under siege as even the major networks realize that audiences are now demanding what the likes of HBO are delivering. When a production and writing team has 10 hours to flesh out the subtleties of character and plot, the result is generally closer to a long movie than a television show. A case in point is HBO’s recent acclaimed series The Night Of. The story is ostensibly about a Pakistani-American student accused of murdering a young woman whom he meets one night. Had Law & Order taken this story and turned it into an episode, the salient facts of the crime itself and the courtroom drama would have played themselves out much as they do in The Night Of. But The Night Of takes the framework of that story and scrutinizes it through the lens of race, prejudice, immigration and the impact of the imprisonment of a young man in a harsh and bleak prison system. Relying on stunning performances by every cast member, the series sheds a searching light on how the fabric of a family withstands or succumbs to the trauma. With the emergence of other countries producing crime series that are both suspenseful and thought-provoking, the need to raise the bar in the American television community grows. Having learned from, and improved upon, U.S. televised crime dramas, writers and producers in the rest of the world could have a trickle-down effect on what their American counterparts can do in the future. This can only be good, especially since there is a difference between the non-American and American genres that can be traced back to the way solving a crime is depicted. The non-American versions stress the necessity for cooperation and rational intelligence, be it for the detective work itself or the potential coverup. The characterization and plot are moved along by conversation, finely executed schemes and often Machiavellian planning. The plots are driven by dialogue, encounters, real investigative work and accidental sightings of what the audience often knows but the characters, at that point in the narrative, do not. The American versions, in contrast, are usually crafted around an improbable event, the cliffhanger that often ends each episode (a product of the serialized story arc), and inventions that show off the writer’s impressive imagination and the detective hero’s superiority but actually bear little resemblance to the drudgery of true detective work. Speed, surprise and the de facto shootout drive many American versions of the crime genre. But prospects are improving as premium television providers like HBO, Netflix and Amazon have found success with their own brand of original content. A good example can be found in the two 10-part Bosch series, based on the novels of America’s top-ranked crime writer Michael Connelly, which in certain ways are more like their European counterparts. Crime drama will probably always be a staple on television given its lasting allure for millions of viewers around the world. What has changed, though, is that the productions now being shown are as likely to come from Britain or New Zealand – or even Iceland – as from Hollywood. And in a television landscape where quality and diversity seem to be constantly improving, that can only be a good thing. 1 Carole Kismaric and Marvin Heiferman, The Mysterious Case of Nancy Drew & The Hardy Boys (New York: Simon & Schuster, 1998), p. 56. 2 David Marc, Demographic Vistas: Television in American Culture (Philadelphia: University of Pennsylvania Press, 1996), p. 73. 3 In 2005, Paste was listed at number 21 on the Chicago Tribune’s list of “50 Best Magazines”; it appeared on the list again in 2007. Paste was also named “Magazine of the Year” by the PLUG Independent Music Awards in 2006, 2007 and 2008. In 2008, 2009 and 2010, Paste was nominated for a National Magazine Award in the category of General Excellence, and in 2010, associate editor Rachael Maddux’s writings were nominated for Best Reviews.